Salmonella enterica and Campylobacter jejuni are amongst the more prevalent bacterial pathogens that cause foodborne diseases. These microorganisms are common contaminants of poultry and poultry products. This study was aimed to evaluate the antibacterial activity of metallic copper surfaces on these important enteropathogens, and to determine the potential acquisition of copper by food exposed to this metal. The antibacterial activity of copper surfaces was evaluated overlying them with suspensions of 106 CFU/ml of S. enterica and C. jejuni. Bacterial counts obtained after 0, 2, 4 and 8 hours at 10°C and 25°C were compared with those obtained in stainless steel and a synthetic polymer as control surfaces. The results showed that when these enteropathogens were kept in contact with copper a significant antibacterial activity was noted, on the contrary when the same load of pathogen suspensions were tested over the control surfaces it was found that the bacterial counts remained unchanged or even increased with time. The potential acquisition of copper by food exposed to this surface was also evaluated. Meat exposed for one hour to a copper surface adsorbed residual copper in a time dependant manner. These results shows that metallic copper surfaces have an antibacterial activity against S. enterica and C. jejuni and suggest its potential application as an inhibitory agent in the various stages of the food processing operations. The microbial contamination of foods is an increasing public health problem, enhanced by the modern necessity of consuming foods outside the home. Frequently, the raw materials utilized to prepare food contain live microorganisms and some of them may be able to cause diseases in susceptible hosts. Improper manipulation and cross contamination during industrial processes or improper handling by the consumer also contribute to the spread of the dangerous microorganisms. Any effort aimed at decreasing food contamination would contribute to safer and better foods. The Centers for Diseases Control and the Food and Drug Administration of the United States of América (USA) have estimated that over 30 million people each year get sick due to infections caused by consuming contaminated foods and of those, about 9,000 die [1, 2]. Studies have shown that S. enterica and C. jejuni are amongst the more prevalent bacterial pathogens that cause foodborne infections [1, 3, 6]. According to official estimates the medical and productivity losses caused by these two enteropathogens in the USA were over the 3 billion dollars in 1995 . The enteric infections caused by C. jejuni and S. enterica are frequently associated with the ingestion of meats, eggs and dairy products. In Chile, as in other countries, chickens are an important reservoir for S. enterica and C. jejuni . Living organisms requires copper at low concentrations as cofactors for metalloproteins and enzymes, however at high concentrations, Cu(II) induces an inhibition of growth in bacteria [5, 12, 13], and have a toxic effect on most microorganisms. This effect may involve substitution of essential ions and blocking of functional groups of proteins, inactivation of enzymes, production of hydroperoxide free radicals by membrane bound copper, and alterations of membrane integrity [2, 9–11]. Recent studies have shown that metallic copper and copper alloys have antibacterial activity over the harmful bacterium E. coli O157:H7  and also inhibits the adhesion of bacteria on biofilm development . Considering these antecedents, we aimed this study to the evaluation of antibacterial activity of copper surfaces on two frequent bacterial enteropathogens, S. enterica and C. jejuni. S. enterica showed lower counts on copper surfaces as compared with those obtained on the control surfaces in the viability assays at 25°C and 10°C (Figures 1A and 1B). These differences became significant at 2 hours at 25°C (p = 0.0001) and at 4 hours at 10°C (p < 0.05) of exposure. 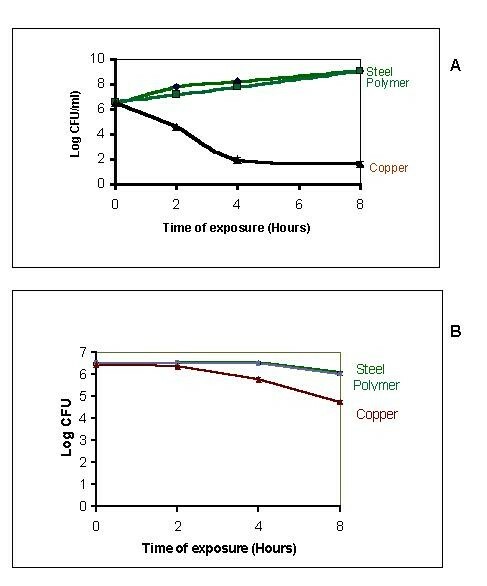 The antibacterial activity of the copper surfaces was clearly more effective at 25°C for every time of exposure event (Figure 1A compared to Figure 1B). Survival of suspensions of S. enterica on different surfaces. 3 × 106 /ml bacterial cells/ml were left on copper, steel and polymeric surfaces, and incubated at 25°C or 10°C. Alíquots were taken at 0, 2, 4 and 8 hours. The plots show the logarithm of the average from the plate counts (CFU) for each assay. The vertical bars represent the standard error of the mean (SEM) for each point A) Assay at 25°C. The differences between the bacterial counts from the copper surfaces and the control surfaces were significant at the times 2, 4 y 8 hours (P < 0.0001). B) Assay at 10°C. Differences between the bacterial counts from the copper surfaces and the control surfaces were significant at 4 hours (p < 0.05) and 8 hours (p < 0.0005). Figures 2A and 2B present the results obtained with C. jejuni exposed to different surfaces. As occurred with S. enterica, the plate counts of C. jejuni maintained on copper surfaces were lower compared with those obtained with the control surfaces. The differences in the number of viable bacteria on copper and control surfaces reached statistical significance (p < 0.0001) in 4 and 8 hours of exposure at 25°C and 10°C respectively. The inhibitory effect was again more evident at 25°C. Survival of suspensions of C. jejuni on different surfaces 3 × 106 /ml bacterial cells/ml were left on copper, steel and polymeric surfaces, and incubated at 25°C or 10°C. The plots show the logarithm of the average from the plate counts (CFU) for each assay. The vertical bars represent the standard error of the mean (SEM) for each point. A) Assay at 25°C. Aliquots were taken at 0, 2, 4 and 8 hours. Differences between the bacterial counts from the copper surfaces and the control surfaces were significant at 4 and 8 hours (P < 0.0001). B) Assay at 10°C. Aliquots were taken at 0, 4 and 8 hours. Differences between the bacterial counts from the copper surfaces and the control surfaces were significant at 8 hours (P < 0.0001). These results indicate that copper sheets have an inhibitory effect on S. enterica, and C. jejuni, and control surfaces have no effect on these two enteropathogens. Data also suggest that copper surfaces could be utilized to diminish cross contamination due to the fluids containing these pathogens in areas like food processing operation surfaces. Taking into account that the inhibitory effect was probably due to the liberation of copper by the sheets, we wanted to determine if food exposed to this surface could adsorb some of this metal. The potential acquisition of copper by food exposed to this metal was evaluated using pieces of chicken and pork meat left on copper surfaces for varying periods of time. These samples were analyzed to measure the copper concentrations. The study included 60 samples of meat, 30 from chicken and 30 from pork. As shown in Figure 3 the copper content (mg/100 g of meat) of chicken and pork meat pieces increased after exposure to copper surfaces. After 10 and 50 minutes the copper content of the samples reached 0.6 and 2.0 mg of copper/100 g respectively. In order to see if common bacterial contamination of meat could further increase the copper content, a subset of 3 samples of chicken and 3 samples of pork were experimentally contaminated with E. coli before the exposure to copper surfaces. Results were similar to those obtained with uncontaminated meats (data not shown). Copper content in chicken and pork meat after exposure to a copper surface. The plot shows the average of the copper content (mg / 100 g) of 30 samples each of chicken and pork meat maintained on copper surfaces for 0, 10, 20, 30, 40, and 50 minutes. The objective of this study was to evaluate the antibacterial activity of copper surfaces on two highly prevalent enteropathogens, S. enterica and C. jejuni. The results showed that the copper surfaces do have an important antibacterial activity on these two pathogens, tests were conducted at 10°C and 25°C, conditions that resemble those utilized during food processing and after manipulation (during the night) respectively. The control surfaces, stainless steel and a synthetic polymer, which are materials commonly used by the food industry, showed no antibacterial activity. The inhibitory effect of copper was dependent on the time of exposure of bacterial suspensions. In most cases, antibacterial activity was already evident within two to four hours of exposure, and increased thereafter. Temperature was also an important factor, since the antibacterial activity was always more effective at 25°C. Figure 1A (25°C) shows that at 2 hours, the decrease in CFU/ml was about 2 log, enough to reduce the initial inoculum of S. enterica below the infective dose for this pathogen. At 4 hours, the inhibitory effect of copper was remarkable, showing a decrease of 4 log and 6 log with respect to the initial inoculum (t = 0) and to the controls respectively (Figure 1A). The antibacterial activity on S. enterica was also present at 10°C (Figure 1B), the decrease in the viable bacterial concentration was about 2 log at 8 hours with respect to the initial inoculum. Copper surfaces also had an important inhibitory effect on C. jejuni at 25°C, the decrease in the CFU/ml was about 4 log with 4 hours of exposure to this metal; with 8 hours of exposure the reduction was about 5 log, reaching a CFU/ml below the infective dose (Figure 2A). 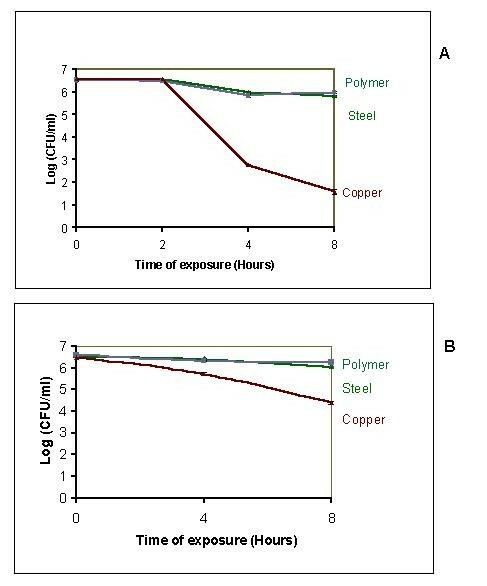 At 10°C the inhibitory effect was less intense (Figure 2A), with a decrease in the viable C. jejuni cells of about 2 log at 8 hours of exposure to the copper sheets. Absence of the two hour point in the plot was due to some technical difficulties in the assays, but the available data showed almost no inhibitory effect at this point. Thus, the antibacterial effect was similar for S. enterica and C. jejuni at 10°C and was slightly higher for S. enterica at 25°C. The differences observed in the inhibitory effect with the temperature may be due to an increase in the release of Cu(II) ions, or to an increase in the copper intake by the bacterial cell, with a higher temperature. Taking together, these findings suggest that metallic copper may have a potential application in decreasing the bacterial load in some areas with a high exposure to bacterial contamination like that usually found in poultry slaughterhouses. Thus, the use of copper sheets would be particularly useful to decrease the cross contamination caused by bacterial pathogens like S. enterica and C. jejuni. As we were carrying out the assays, the appearance of the copper surfaces changed, the metallic aspect of new copper sheets turned a dark brown color. In addition, we realized that the bacterial suspensions were acquiring a pale blue color, indicative of the release of Cu++ ions, which was deeper with time of exposure. To see the effect of copper ions release in exposed food we tested the content of this metal in meat samples. 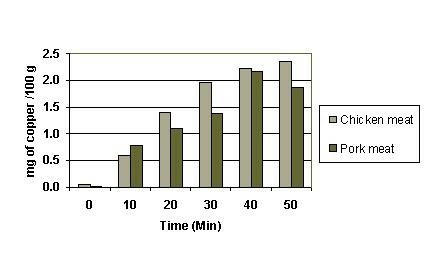 The analysis of residual copper showed that effectively, there was an increase in the copper content of meat pieces with the time, reaching 2 mg/100 g after a 50 minute exposure (Figure 3). Copper acquisition was faster in the first 30 minutes, being slower afterwards. Assays done for 2 or more hours of exposure indicated only a small increase compared to the 50 minutes point (data not shown). These results shows that the copper adsorption by meat due to a continuous exposure to a copper surface tends to reach a maximum value of about 2.5 mg/100 g.
The Recommended Dietary Intake (RDI) for copper is 0.9 mg for adults (19–50 years), while the upper limit of intake for this metal is 10 mg for the same population. An excessive copper release is therefore a limiting factor to take into account. Under normal processing circumstances the exposure of food items to the surfaces is normally short, not more than a few minutes, so copper acquisition would remain very low. It should be pointed out that the use of copper surfaces would not be intended to be the first line of defense against pathogenic bacterial contamination, or to replace the normal hygiene procedures in a food processing plant. The main application of copper surfaces would be decreasing the bacterial load that may remain on it after the daily work, which could survive the normal cleaning procedures. Copper sheets may decrease the capacity of harmful bacteria to remain viable or to form biofilms after some hours on the surface, and may be useful to reduce cross contamination or to act as auto-disinfectant surfaces in areas where a continuous bacterial load is produced. Future studies will include the utilization of different copper alloys that diminish the copper liberation while maintaining an antimicrobial activity. The antibacterial activity of copper surfaces was evaluated by overlying suspensions of S. enterica and C. jejuni on copper surfaces, stainless steel, and a synthetic polymer. Standardized bacterial suspensions, 3 × 106 cells per ml, were deposited over the surfaces and bacterial concentrations counted at 0, 2, 4 and 8 hours. The experiments were performed at 10°C and 25°C, and each assay was carried out in duplicate. Results were calculated as the average of five independent assays for each strain and temperature. S. enterica was grown on xylose lysine deoxycholate (XLD) agar and Brain Heart Infusion broth (BHI). C. jejuni was grown on Skirrow agar (Columbia agar base supplemented with 7% horse blood), and Exeter base broth. All media were acquired from Oxoid. S. enterica (serovar enteritidis) and C. jejuni utilized in this study were isolated from chicken and identified by standard biochemical tests and PCR (15, 16). E. coli was isolated from a healthy individual, all strains were maintained frozen (-20°C). Metallic (electrolytic purity) copper sheets 0.5 mm thickness was used to evaluate copper antibacterial activity. Stainless steel sheets (0.5 mm) and polyformaldehide (formalite) obtained locally were used as controls. S. enterica was inoculated in BHI broth from a single colony in a XLD plate and incubated at 37°C overnight, 0.5 ml was then taken and added to 25 ml of fresh broth, which was incubated with shaking at 37°C for 90 minutes. The absorbance at 600 nm of the bacterial growth was measured, and the culture was adjusted to approximately 3 × 106 bacterial cells/ml by dilution in BHI broth. C. jejuni was seeded on a Skirrow selective plate, incubated in a reduced oxygen atmosphere in a gas jar with a gas pack (Campylobacter Gas generating Kit BR60) at 42°C for 18 hours. The bacterial growth was harvested in Exeter broth and also adjusted to 3 × 106 bacterial cells/ml as described for S. enterica. Bacterial suspensions were overlaid on sterile copper and control surfaces, the viable counts were performed at 0, 2, 4 and 8 hours. Copper, stainless steel, and polyformaldehide sheet circles (8.5 cm diameter) were kept in Petri dishes during the experiments, which are maintained in a closed plastic box in humid conditions (with wet paper towels). 1.5 ml of the bacterial suspensions was overlaid on the center of each circle. Aliquots, 100 μl, were successively taken in duplicate for each of the conditions assayed, and diluted in order to obtain suitable plate counts. 100 μl of each dilution were inoculated on appropriate agar plates for each strain. Plate Count Agar was used for S. enterica, and incubated at 37°C for 24 hours. C. jejuni was plated onto Skirrow agar plates and incubated at 42°C for 40 hours in microaerophilic conditions. The colonies were counted, and the results were expressed as colony forming units per ml of sample (CFU/ml). In order to determine if copper would adsorb to exposed meats, chicken and pork pieces 2 × 2 cm (4–5 g) were placed for 0, 10, 20, 30, 40 and 50 minutes on copper sheets at room temperature (22–26°C). A set of copper sheets was used several times in these assays. A total of 30 samples of chicken and 30 samples of pork were analyzed. Prior to the exposure to the copper surfaces, all meat pieces were kept for few seconds in saline solution (0.85%) to simulate wet conditions commonly found in the processing of these products. The copper content in the meat pieces was determined by atomic absorption spectrophotometry in duplicate samples, according to the AOAC procedure . To take into account a potential effect of the bacterial load on the amount of copper detected in the exposed meat, the same procedure was performed in a subset of 3 samples of chicken and pork, which were previously contaminated by immersion for 5 minutes in a suspension of E. coli (104 CFU/ml in saline solution). The data were analyzed using the statistical software Statistica (Anova/Manova for the statistical parameters of the averages, and the Scheffe test of multiple comparisons for the statistical significance). Each point of the results represents the average of five independent assays, for each time of exposure to copper. G. Figueroa conceived the study and participated in its design.